We entered the relatively narrow entrance to English Harbour with Fort Berkely built on a narrow spit of land enclosing the Harbor to our Port, and the massive rock formation known as the Pillars of Hercules with ruins of the upper and lower Fort Charlotte, on our starboard. As we turned to port into the Harbor around Fort Berkely Point, we could see stern tied yachts lined up around the quay wall at Nelson&apos;s Dockyard with its two story stone 17th century barracks and other dockyard buildings behind. We were instantly transported back in time. It was as though you could almost see and hear English sailors tending to their ships at the quay wall, and the marching of troops around the barracks with a glimpse of their bright colored uniforms in the distance. 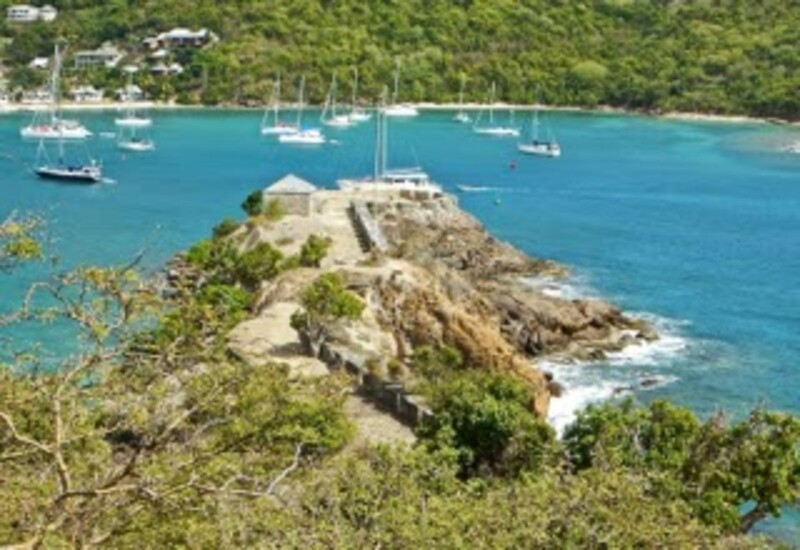 History was alive in this beautiful special Harbor with its green foliage on the steep hills that surrounded it, with its white sand Galleon Beach which greeted us just inside the Harbor entrance, and with its turquoise colored water in Tank Bay behind the Dockyard. Boats on the quay wall. 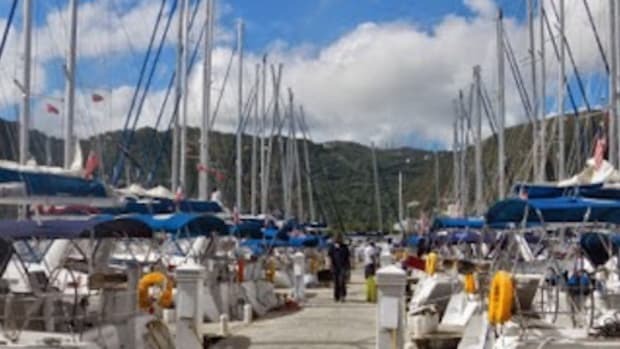 The only anchorage available in the Harbor (with the exception of stern tying at the quay wall) is at Freeman Bay adjacent to Galleon Beach just inside the entrance to the Harbor, except one spot I had seen at entrance to Tank Bay when we were their earlier in the week. As we rounded the Dockyard on its back side I crossed my fingers as the entrance to Tank Bay came into view. It was vacant! This was a tight spot for our boat. We were at least 20 ft. longer than the sailboat I had seen in this spot earlier. 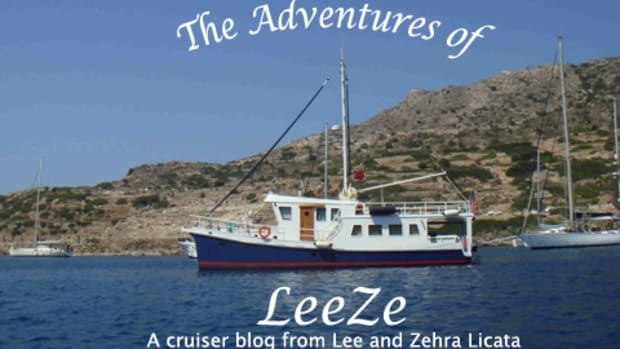 We had to find a place to drop the anchor with out interfering with the anchors of the boats stern tied to the quay wall, and not swing into the shore on either side with wind shifts. It took us two tries but we got it. Tucked back in the Harbor as we were it was flat even though the winds were blowing 25 nmph. 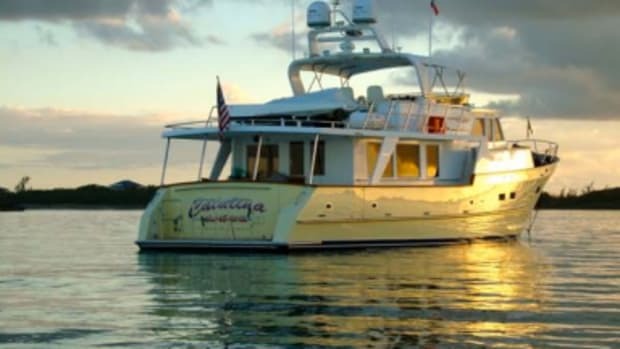 It was a pleasant relief from the hour we had spent "easting" directly into 8 ft. seas along the south side of the Island on our trip from Jolly Harbour. What a perfect anchorage. 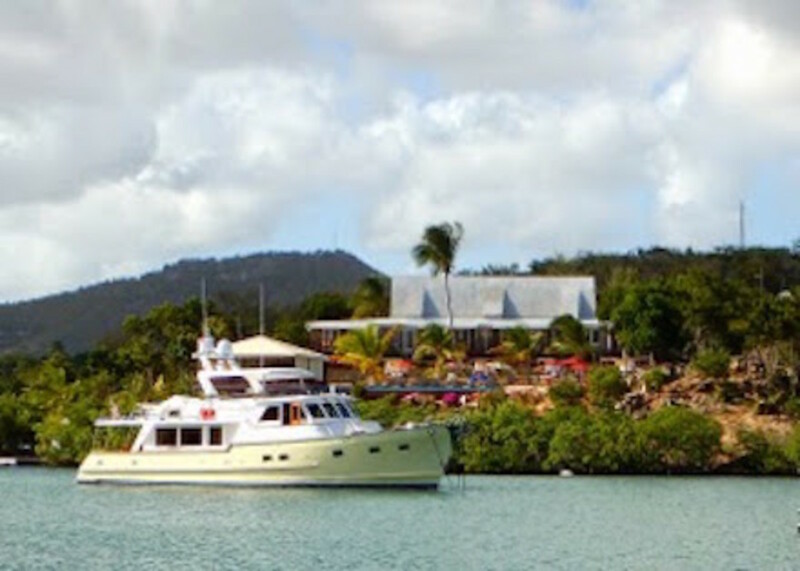 On the Dockyard side we had the Admiral&apos;s Inn with the Pillars Restaurant, and on the opposite side we had the Admiral&apos;s Inn Gunpowder Suites and pool with the poolside Boom Restaurant on a hill overlooking the mangroves at the shoreline next to us. The Admiral&apos;s Inn is in an historically renovated. 1700 century two story brick and stone building with the Admiral&apos;s Bar on the first floor. 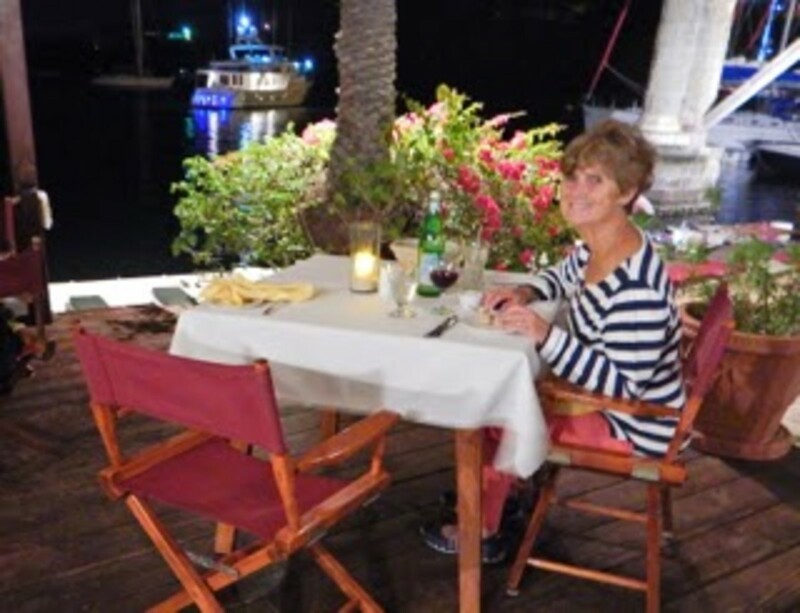 The Pillars Restaurant is an open air restaurant between the Inn and the water with a garden and small beach on both sides of a line of massive stone pillars and a moat like channel that are part of the ruins of a dockyard sail loft. The Gunpowder Suites are in a rehabilitated building that once housed gunpowder and was set across Tank Bay to protect the Dockyard from explosion. 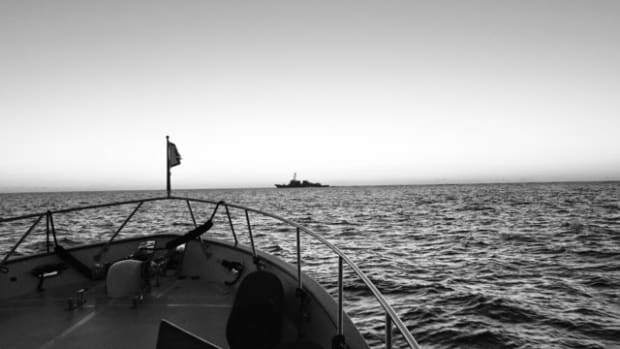 A small outboard passenger ferry ran the 150 ft. between the Inn&apos;s facilities on both sides of Tank Bay. The ferry, which ran on demand, passed within 15 ft. of our stern. We ate our first meal in English Harbour at the Pillars Restaurant with a dock side table looking out on English Harbour and Catalina Sunshine. It was a great meal, and for us at least, a spectacular view. Jackie and I toured the Dockyard that Beth and I had toured after dinner the night before. 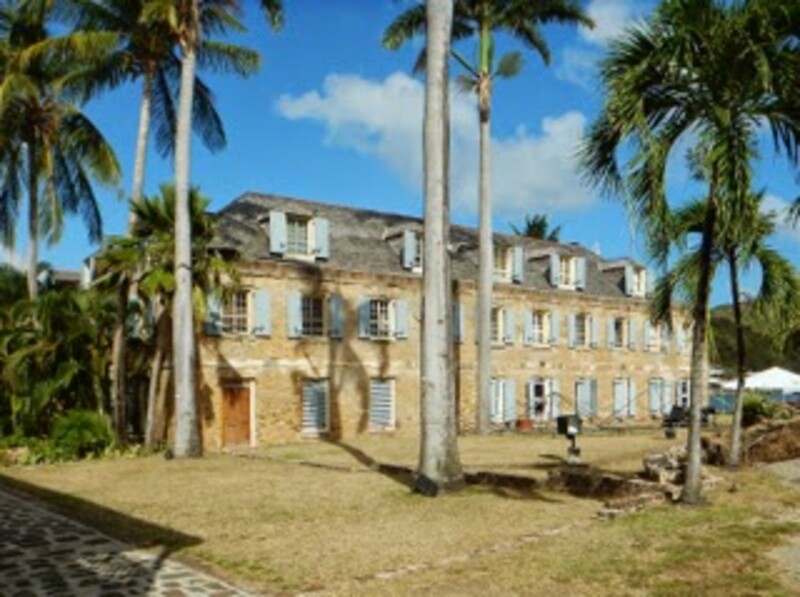 The Dockyard&apos;s buildings have been historically rehabilitated to accommodate restaurants, bars, boutiques, a package store, a bakery, a sail repair shop, a hair salon, offices for customs and immigration, and a museum. 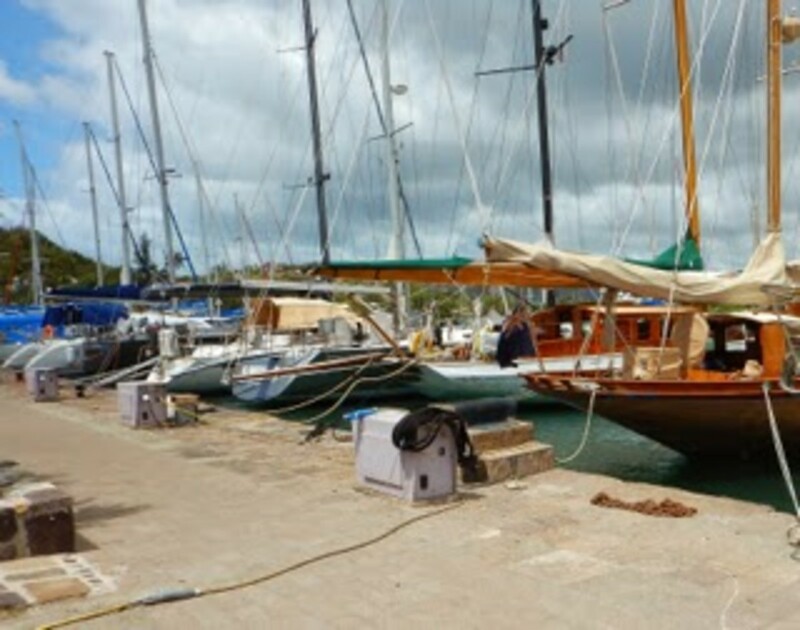 Replacing the sailors and soldiers which occupied this space during the 17th and 18th centuries were tourist to this Antigua Historical Park, boat owners and their crew, and restaurant patrons. Walking out on Fort Berkely we could see how easy it was to defend this naturally protected harbor. Almost the entire sea side of the sprint of land on which the fort is constructed, is fortified with thick stone walls with vertical embrasures to accommodate cannons from a height of about 60 ft. above the water. In times of siege a chain and wood boom was drawn across the entrance to the Harbor for further protection. 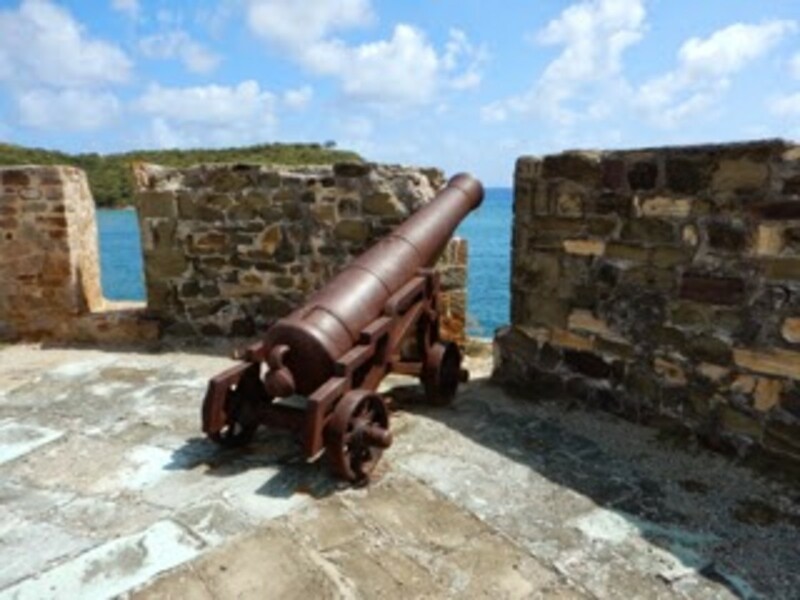 Although many of the Caribbean islands changed hands from the 1600&apos;s through the 1900&apos;s, Antigua remained British and the impenetrability of English Harbour was probably the reason. Captain Horatio Nelson sailed into English Harbour aboard the the HMS Boreas to serve as Second Commander of the Northern Division of the Leeward Islands. The year was 1784, and he was 26 years old. After attending grammar school at the age of 13 Horatio joined the Navy as an ordinary seaman. He commanded his first vessel at the age of 19, and by the time he arrived in Antigua he had sailed across the Atlantic ocean numerous times, been on assignment in the East Indies, escorted a convoy from Russia, sailed to Newfoundland, sailed within 10 degrees of the North Pole, sailed the American Coast several times, had assignments in Jamaica, Costa Rico, and led an assault of several ships against the French in the Turks Islands as one of his several command combat assignments. During his time in Antigua Horatio&apos;s second in command was Prince William Henry, who latter ascended to the throne as King William IV. After marring Fanny Nesbit of Nevis in 1787 with is friend Prince Henry as best man, Horatio left Antigua for England, at age 29. Horatio Nelson lived for 19 more years dying in 1805 in battle at Trafalgar where he lead 27 ships against a combined French and Spanish joint force of 33 ships, as Vice Admiral. As a result of Admiral&apos;s Nelson strategic leadership the British won the battle putting to rest Napoleon&apos;s plans to invade England. This was the last of Admiral Nelson&apos;s many victories including ones he personally lead into hand to hand combat. During this time Nelson became a hero attracting large crowds where ever he traveled in England between his extensive assignments at sea. This man died at 48 with a unparalleled 35 year naval career, as a true hero. During this time he had lost both an arm and an eye in combat and made the ultimate sacrifice for his country at Trafalgar. 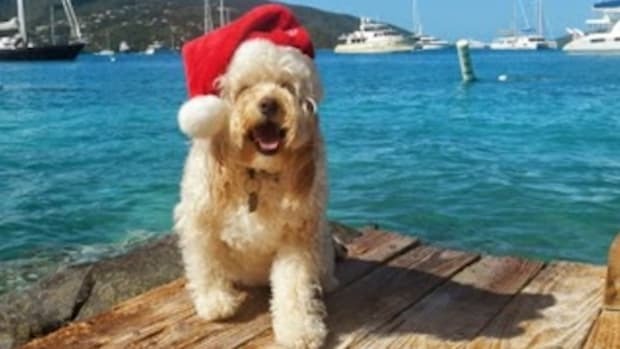 Although only in Antigua for a comparatively uneventful 3 years in English Harbour&apos;s over 400 year history, the Dockyard and the Inn are named in his honor. After visiting the Museum in the Dockyard and reading about Horatio Nelson, it occurred to me that sailors, and trawling sailors like us, dress like pirates and pay homage to the likes of Edward Teach, but know little about Horatio Nelson and other naval heroes. Edward Teach, or Blackbeard as he was known, became a pirate on New Providence Island in the Bahamas at age 36 in 1716. There is no prior history of his earlier career, although it is believed he was a merchant seaman. He was killed in a battle at Ocracoke Island in the outer banks of North Carolina two years later, in 1718. A quirky fellow, which undoubtedly was the inspiration for the character Jack Sparrow in Pirates of the Caribbean, Teach who already looked scary, is said to have tied fuses under his hat to frighten his enemies. Most of his victories were capturing unarmed merchant vessels and steeling their cargo. He ran his ship Queen Ann&apos;s Revenge aground in Beaufort Inlet damaging it beyond repair. He was killed by sailors under command of an undistinguished lieutenant, after running his ship Adventure aground trying to escape through Ocracoke inlet, a passageway familiar to Teach. Would it not be more fitting to be parroting and singing about 18th century Limey heroes like Horatio Nelson then pirates like Edward Teach? Follow more Catalina Sunshine here.